The Green Jackets and the Royal Green Jackets were the fastest mechanised Infantry Regiment, marching with a pace of 140 to the minute, not bearing Colours and responding to the sound of a Bugle. The men of Green proudly went into service of their Sovereign and Country, earning many battle honour`s, Peninsula being one of them. The Regiment’s lowest rank, unlike other Regiments who have Private, was referred to as a Rifleman due to the weapon that they used, the Baker rifle. The other notable difference was that of a Sword fixed on the Rifle instead of a Bayonet. Her Majesty Queen Elizabeth ll was the Colonel in Chief of the Regiment until their disbandment. The lessons of the past achievements of the illustrious predecessors and traditions of those who deserve to be remembered dating back to the Napoleonic wars, Duke of York’s own Rifle Corps had a change in name to be called “The Kings Royal Rifle Corps” and it was in 1858 that the Rifle Depot at Winchester was made their headquarters. The Kings Royal Rifle Corps (KRRC) had 22 Battalions over 12,000 soldiers of which 8 members won the Victoria Cross. 1922 saw the Regiment reduced and in 1926 the Regiment was re-organised to be one of the first mechanised Infantry Regiments. 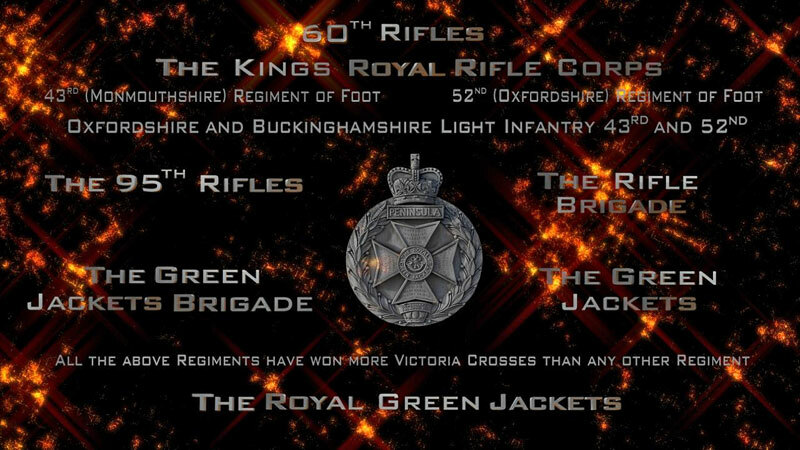 1948, for the purpose of administration, the Kings Royal Rifle Corps was brigaded with the Oxfordshire and Buckinghamshire light infantry 43rd and 52nd and the Rifle Brigade to form the regiment Green Jackets Brigade. 1958 the Regiment was retitled 2nd Green Jackets, The Kings Rifle Corps, the two other Regiments of the Green Jackets Brigade were retitled 1st and 3rd Green Jackets. 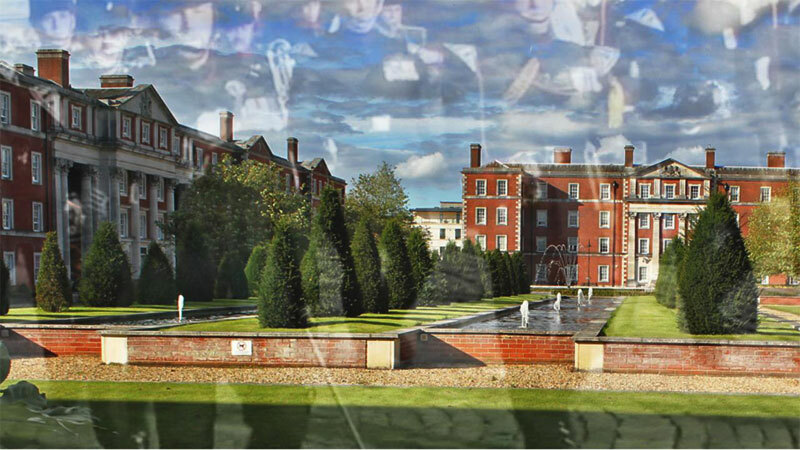 1957 The Regiment moved to Peninsula Barracks and on the 7th of November 1958 the Regiment transferred from the light Infantry Brigade to the Green Jacket Brigade. The 1st Battalion, The Royal Green Jackets, whose illustrious predecessors were the Ox & Bucks was retitled, The 1st Battalion the Oxfordshire and Buckinghamshire the Light Infantry 43rd and 52nd. Then there was the 2nd Battalion of The Royal Green Jackets, whose illustrious predecessors were The Kings Royal Rifle Corps. Then last but not least, the 3rd Battalion of The Royal Green Jackets, whose illustrious predecessors were the Rifle Brigade. 1986, The Royal Green Jackets marched for the last time out of the gates of Peninsula Barracks, their ancestral home, leaving behind the forefathers of their illustrious past, which had earned them many battle honours, among them Peninsula. The Regiments motto Celer et Audax Latin for Swift and Bold. Those that make up the fabric of the Regiment were swift to take arms on foot and bold in the defences of our realm. 1992, in a reorganisation the 1st Battalion the Royal Green Jackets was disbanded and the 2nd Battalion the Royal Green Jackets were renumbered as the 1st Battalion of the Royal Green Jackets; the 3rd Battalion of the Royal Green Jackets, the former Rifle Brigade becoming the 2nd Battalion The Royal Green Jackets. 2007 the two remaining Battalions of the Royal Green Jackets with the remaining light infantry regiments amalgamated to form another Regiment, for the Royal Green Jackets there were no more parades. 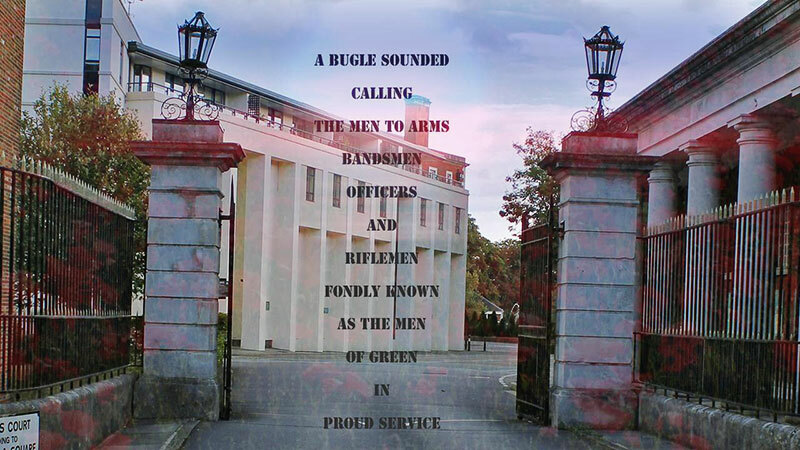 It is fitting to mention that the new Regiment formed from the illustrious forefathers houses its headquarters in the Peninsula Barracks, once a Castle, the ancestral home of the (Royal) Green Jackets, the newly named regiment The RIFLES.